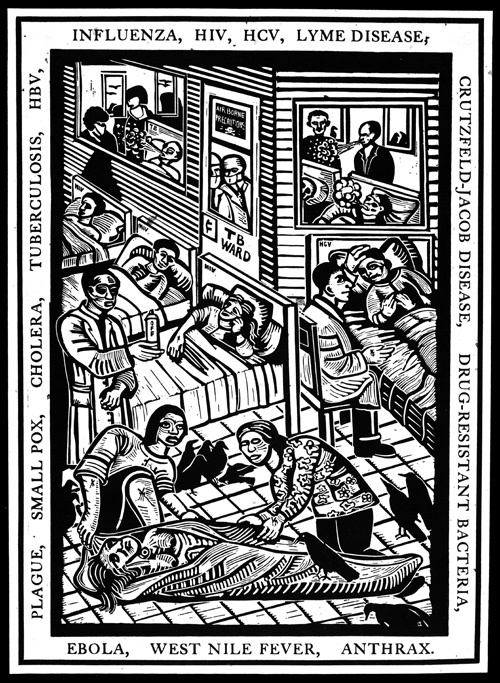 This print, EMERGING INFECTIOUS DISEASES, commemorates the Emerging Infectious Diseases: Ethics, Law and Professional Obligation Conference held in Galveston, Texas April-16-18, 2009. It was first printed for the 37th International Congress on the History of Medicine held in Galveston, Texas September 10-15-2000. It is a reduced relief engraving of a linocut by Eric Avery. The print appropriates a French woodcut of a hospital interior from Saint-Gelais Le Vergier d’Honneur, a devotional Book of Hours, printed in Paris around 1500. On the left, in front of three HIV/AIDS patients, a physician holds a spray can of OFF, an insect repellant distributed around New York City during the initial 1999 United States outbreak of West Nile encephalitis, an infection spread by mosquitoes. In the foreground, a corpse, surrounded by crows, is being prepared for burial. Birds, especially crows, are particularly susceptible to West Nile, so sudden die-offs of birds were an important harbinger of the disease. Birds also appear to play the leading role in transporting the virus from one region to another. Mosquitoes, seen on the hands, arms and legs of the nurses and doctors in the print, carry the virus between hosts. The type around the print was handset by Gordon Rouze, a retired attorney and proprietor of the Arm and Hammer Press, Houston, Texas. 10 3/4" x 7 3/4"